The invitation said “you’re cordially invited to attend a luncheon sponsored by the Jewelry Information Center at the Russian Samovar restaurant.” The reason for the event was to thank us members of the fashion press for our coverage of the jewelry industry. Immediately thoughts of overflowing goody bags danced in my head. Alas, it was not to be, however the luncheon was a fun affair with honest-to-goodness authentic Russian food in an atmosphere that would have done a Chekhov heroine proud. Face it folks, in this slumping economy, the last thing any woman needs is another piece of jewelry or a new watch. But guess what, not everything has to cost an arm and a leg and designers have taken note of that fact. Therefore many have rediscovered the inherent beauty in sterling silver. Combining sterling with gold is a hot way to keep costs down. We’ll see silver blackened, textured or paired with gold in the months to come. But get this, according to the experts at Kico.com, gold is one of the best investments today, second only to the Swiss franc. Sure beats putting money in a low rate CD! O.K. Lets get down to the upcoming trends for fall/winter 2008 – 2009 according to the experts at JIC: Oversized necklaces are important (we’ve all seen the expensive clunkers that have appeared in the mags), but in the fine jewelry arena, look for snake-like chain link, triple strand beauties; mesh webbing bib shaped precious metal styles; intertwined chain link necklaces; and modern chunky Riviere necklaces (made to look like a river of gemstones) crafted from affordable semi-precious colored stones clustered together. 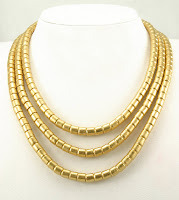 Check out this multi-strand 24 karat gold necklace by Gurhan. Fall/winter is under control! 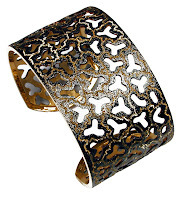 Big, bold blackened and bejeweled cuff bracelets, especially blackened sterling silver versions are hot, hot, hot! These are often accented with mostly cabochon, milky and opaque gem stones. More expensive versions will feature rose-cut diamonds. For those for whom money is no object, black gemstones paired with high carat gold is sure to attract envious glances. Alex Soldier's cuff bracelet... I can feel it embracing my wrist like a long lost... wait this is a fashion blog not some romantic drivel. Just gaze upon it longingly until you get one. They’re ba-a-ck! Big gold hoop earrings, that is. Concentric circles floating in the center of an outer hoop is a major trend. For those who want more bling for their buck, there are bigger and bolder pave diamond versions in shades that range from black, and brown, to champagne and cognac. 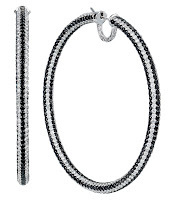 Daniel K's white and black diamond hoop earrings... gorgeous. I adore personally rings and for the last couple of seasons I’ve noticed a return to the classic cocktail ring. When I want a hit of fun color and a bit of sizzle I shop for big, dramatic (costume jewelry) versions, mainly found at thrift stores, tag sales and consignment shops. For the real deal, this season cocktail rings are crafted without using large gemstones. Large discs made from precious metals with interesting treatments sit atop the finger for a ‘60s Mod look. Clusters of small gemstones form a dramatic compilation cocktail ring. For a more avant-garde look, solid carved gemstones feature a hole for the finger. I’ve seen a few of these beauties and I WANT ONE! Got Rocks? 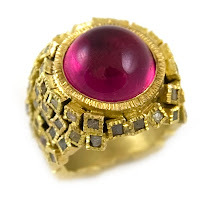 This is Todd Reed's cabochon cut gemstone and rough cut diamond with gold ring. Not only is it gorgeous, it is a wonderful self-defense instrument the TSA won't confiscate. Alright, deep breath, I’m calm now, but I have to admit, that nothing really beats the feeling that I get wearing a great piece of fine jewelry. So, go ahead, indulge. It’s good for the soul and this season it doesn’t have to break the bank and when fads fade, style remains. I have spoken!